With summer speeding by, it may be time to start thinking about the next academic year a little bit. I imagine that some of you are eagerly waiting to find out if you have a place in university, which is a super scary time. Preparing for university, however, can be super exciting and the smallest things such as buying kitchen utensils can be super exciting! If you're going into student halls, here are a few things to think about which will make life a little easier! We're talking plates, cutlery and all those essential utensils. You don't need to go all out and break the bank, but buying kitchen items which look a bit individual can save you from a whole lot of stress in the kitchen! In student housing or halls, cutlery has a nasty habit of going missing and people can be pretty quick to place the blame when they've cooked dinner but can't find any of their forks. I bought a cutlery set from ASDA which had a stripe pattern indented at the ends of the handles. Some of my flatmates had plain cutlery and so they would war over who had taken the wrong spoons and I would be safe in my stripey cutlery situation. The same goes for plates and pans. If you can easily recognise your own things, they are less likely to go missing or be mistaken for another person's items. If someone is up too late and their music is too loud, let them know. If people are having a party in the flat above and you have to get up for work in the morning, ask them to keep it down. Don't let people walk all over you and wind you up. You are all living in the same building and they should respect your needs as much as you respect theirs. If you need sleep and music is keeping you up, ask them to turn it down and they may be more careful with the volume of their music in the future. Otherwise, nothing will change and you will have an awful time! This is sort of similar to the last point, but you will be living in close quarters with a lot of people, and these can be noisy and social places. Get a pair of headphones to drown out the noise when you need to work on an assignment, study, or generally just get a bit of peace. They are an absolute lifesaver! Try and make a point to get to know your flatmates in your first week together. These may be the first people you meet in your new home and living with them for the whole academic year could forge some very strong friendships! Hang out in the kitchen or offer to help someone with their bags when they're moving in. Introduce yourself and don't be scared to have a chat. A lot of people bring a doorstop with them when moving into halls so that people can introduce themselves when passing rooms. It goes without saying, really. You will be living in the same space as your flatmates for quite a while and you don't want to get off on the wrong foot. Keeping the communal spaces tidy after using them will show your flatmates that you respect their living space and encourage them to do the same. Plus, living in a messy student flat can be a nightmare! Student rooms can feel very isolating and cell-like if you are hit by a bit of homesickness. Be sure to make your room homely and inviting so that you like spending time in there and don't feel like you're not at home. I grew to love my room in halls and you will too, it just takes some getting used to and making it feel more like home can definitely help! At the start of first year, I hated reporting issues to maintenance. I felt like a pain and a hassle. 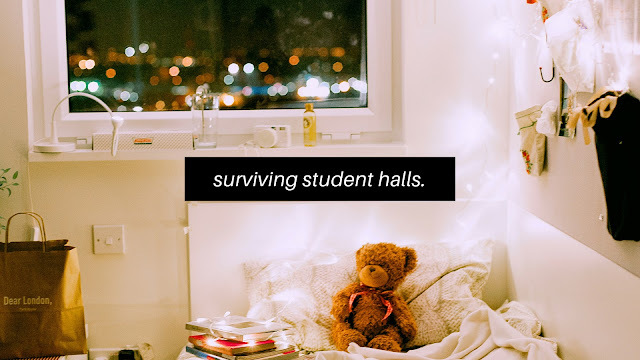 However, a lot of student homes and halls can be a little run down and constant living in the space can take its toll. In my first year halls, I had recurring problems with the window in my room in the middle of winter. I had to report issues to maintenance a lot and if I hadn't then my room would have been painfully cold. Living in student halls can lead to the worst thing about being a student. Overpriced laundry facilities. In my first year I was paying around £4.50 every time I did laundry. This really added up and this is one issue. However, I worked in fast food and had to wash my uniforms quite a lot. The worst thing was when I had walked all the way to the laundry facilities and I had no credit on my laundry card. I would recommend topping up your card in bulk when loans come in or when you get paid. It's way better than having to put more credit onto your card every time you needed to do laundry and it can save a lot of hassle! Here in the UK, we are offered a free MenACWY vaccine before starting university, to prevent meningitis. It is definitely worth getting up to date with your vaccinations before going to university! It could save your life! Living in student halls can be a fantastic experience and you could even meet people who you will be friends with for life! Definitely enjoy it while it lasts and make some great memories! I definitely wished I was back in halls when I moved to my student house during second year!